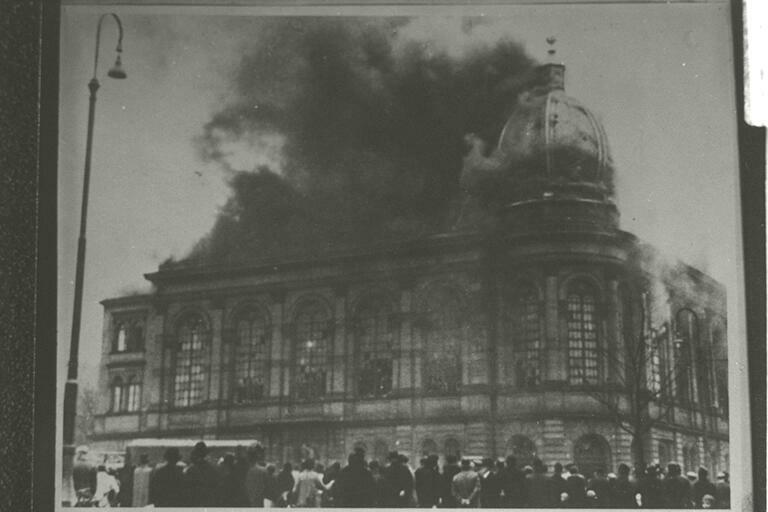 Did Adolf Hitler try to stop the Kristallnacht pogrom? When Adolf Hitler found out about the Kristallnacht pogrom he was angry and ordered Josef Goebbels, the Minister of Propaganda, to stop it immediately. Historical evidence does not support the idea that when Adolf Hitler learned about the Kristallnacht pogrom he tried to stop it. 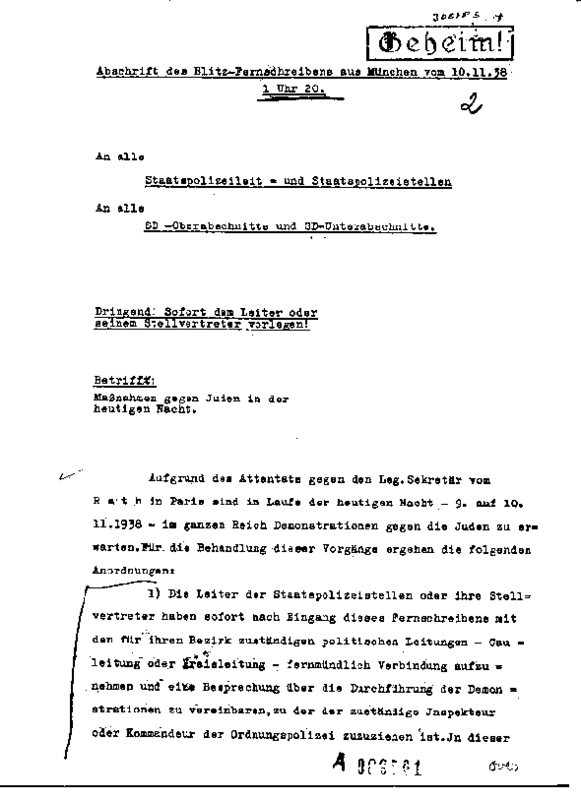 The diary entries of Josef Goebbels, the Minister of Propaganda and a member of Hitler’s inner circle, show that Hitler did not order him to stop the pogrom but rather authorized it. Goebbels’ diary entries shows that Hitler did not order him to stop the pogrom. Rather, Goebbels had a luncheon appointment with Hitler the next day to review the impact of the pogrom. The fact that Hitler gave no orders to stop the pogrom is evidenced in three telexes (telegrams) concerning the execution of the pogrom. High Nazi officials sent these telexes to their subordinates across Germany during the night of Kristallnacht. The telex on November 9, 1938 at 11:55 p.m. The telex on November 10, 1938 at 1:20 a.m.
Reinhard Heydrich transmitted orders from Berlin to the police forces and Gestapo offices across the country. The orders were given to him directly by his boss, Heinrich Himmler (the head of the SS and the police in Germany), who reported directly to Hitler. The only real restrictions Himmler and Heydrich placed on the police and Gestapo is that they were not to endanger German life or property. Synagogues should only be set ablaze if there was no danger of the fire spreading to “Aryan”-owned buildings. The contents of the shops and dwellings of Jews should not be looted. Non-Jewish shops should be protected. Foreign Jews could not be assaulted. Telex signed by Reinhard Heydrich (page 1 of 4). National Archives [Public Domain], via Wikimedia Commons. The telex on November 10, 1938 at 2:56 a.m.
Rudolf Hess sent out a cable to all the party offices throughout Germany. This telex forbade setting fire to Jewish shops: “On express orders issued at the very highest level, there are to be no kind of acts of arson or outrages against Jewish property or the like on any account and under any circumstances whatsoever.” Forbidding the arson of Jewish shops was probably due to the fact that many Jews rented from non-Jews. Thus, burning these shops would actually destroy German property. There was also a risk that the fires would spread to adjacent German property. Finally, it became clear after the pogrom that the Nazis wanted to “Aryanize” the last Jewish-owned businesses in Germany—that is, the Nazis wanted to take them over and provide them to the so-called “Aryan” proprietors. In light of this eventual “Aryanization,” burning the shops and their contents would be counterproductive and wasteful in the long run. The diary entries of Josef Goebbels, a member of Hitler’s inner circle, show that Hitler didn’t order him to stop the pogrom but actually authorized it. Goebbels’ diary reveals that he was thrilled with the progress of the pogrom throughout the night. When he met with Hitler the next day, it was only to conclude the details about wrapping up the pogrom. No other Nazi officials, including others in Hitler’s inner circle, tried to stop the pogrom either. Rather, they sent out instructions throughout the night of Kristallnacht, giving directions on how best to conduct the pogrom. None of these Nazi officials would dare start or encourage major violent action against German Jews without the permission of Hitler. David Irving, Goebbels: Mastermind of the Third Reich (Focal Point, 1996), p. 277. You may download the entire book as a PDF at www.fpp.co.uk/books/Goebbels/. David Irving, War Path (London 1978), p. 165 as cited in Richard J. Evans, David Irving, Hitler and Holocaust Denial, (4)(4.3)(c)(ii)(E)(2-4) at www.hdot.org, “Expert Witness Reports.” Warpath can be downloaded as a PDF at http://www.fpp.co.uk/books/WarPath/. Richard J. Evans, David Irving, Hitler and Holocaust Denial, Section (4)(4.3)(c)(ii)(E)(10). Richard J. Evans, David Irving, Hitler and Holocaust Denial, Section (4)(4.3)(c)(iii)(A)(4). Richard J. Evans, David Irving, Hitler and Holocaust Denial, Section (4)(4.3)(c)(ii)(F)(9). Richard J. Evans, David Irving, Hitler and Holocaust Denial, Section (4)(4.3)(c)(ii)(F)(2). Richard J. Evans, David Irving, Hitler and Holocaust Denial, Section (4)(4.3)(c)(ii)(G)(1). Richard J. Evans, David Irving, Hitler and Holocaust Denial, Section (4)(4.3)(c)(ii)(G)(2-4).